Écologie : Lieux sablonneux, champs, murs, dans toute la France et en Corse. Ecology UK: common in certain dry, sandy and calcareous places scattered throughout England and Ireland. 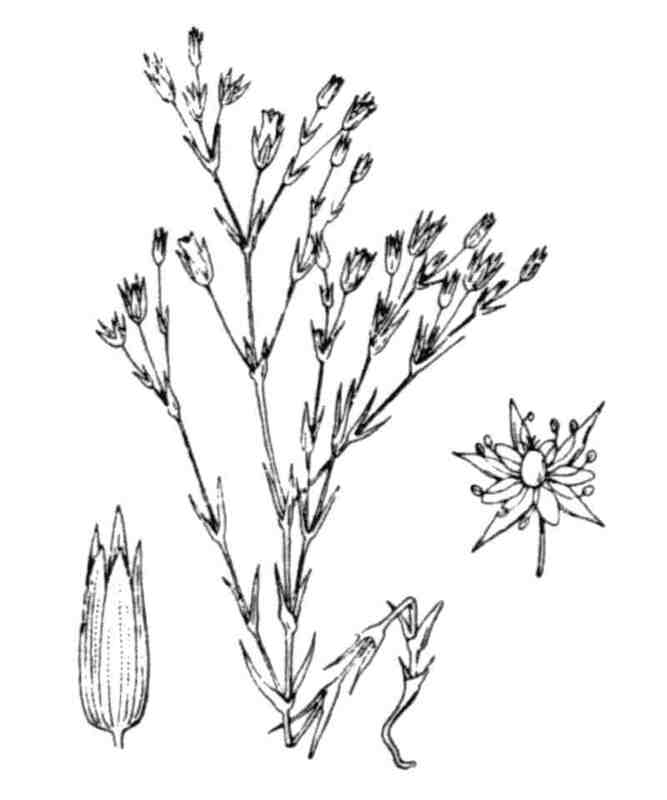 Flowers: 5 mm diam., in much-branched cymes; pedicels medium, glabrous; sepals lanceolate, acuminate, with scarious margins; petals white, half as long as sepals; styles 3. Leaves: 9-10 mm long, subulate, acute. Fruit : capsule oblongue-conique ; graines chagrinées. Fruit: Capsule 5 mm, lanceolate oblong, exceeding sepals; valves 3, long; seed 0.5 x 0.4 mm, reniform, honeycombed and finely tubercled, yellow.